Do you have mounting credit card debt? According to statistics, the average household has over $10,000 in credit card debt! Unfortunately, this number will only continue to significantly increase over the years. I know there are so many life circumstances that get in the way such as medical expenses, job loss, income reduction, and college that can interfere with investing in your retirement. Remember back in the day when credit cards were not needed to keep up with daily life? I remember waiting until Friday to get the good ole paycheck in my hand from my retail job. Then of course I would have to dash off to the bank before they closed to cash my check….and banks did not have these so called “extended hours” like they do now! Back then cash paid for everything. Even for purchases I would count every single dollar I had down to the cents, and yes exact change was very popular then. It was so easy to manage your money and you planned for each day knowing how much you would spend. So if you didn’t have to enough to buy that cute little dress you had your heart set on…guess what…you had to wait for the next payday to get it. Plain and simple. In addition to the high inflation rates we now have to deal with, this is the “Got-to-have-it-now” society where waiting for something is some foreign thing of the past. Looking at bank statements with a surprised look on your face is becoming more of the norm. Well welcome to the world of plastic where credit cards can either be your best friend or your worst enemy. That is why there are Debt Relief programs out there that can help you get back on track to living the best life you deserve. Debt consolidation is the best way to combine your debt into 1 single, low monthly payment. Why pay a high interest rate when you don’t have to? Combine all those credit cards into one loan while you focus on placing extra cash into your retirement account. 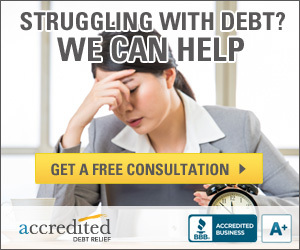 Accredited Debt Relief provide these services along with credit counseling and debt management. They will negotiate with your creditors to reduce the interest rate and remove extra fees. This way it will make the debt manageable and get your debt paid down faster.